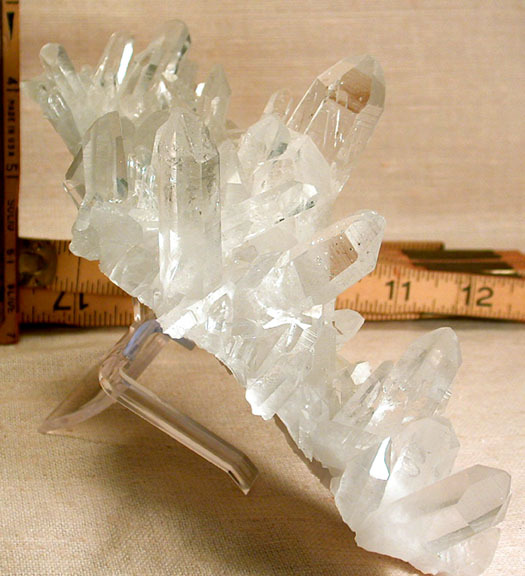 Super Arkansas crystal cluster will receive pride of place in your collection - it spans 7 3/4" [x 3 1/2x 3 1/2"]. The centered, tall point is 3+"x 3/4", with a 7h face, a 1/2" growth crater and penetrators. Three crystals have diamond windows [the only kind of window]; one crystal has an impossibly rare NINE faces; several crystals have 7h faces. A couple of small chips do not detract. There are laser crystals, rainbow crystals, more classic penetrated crystals - including a 2" doubly-terminated one. A plate bottom and back 'sing' when you run your hand over them.